Like many managers, Brendan Rodgers has a habit of speaking his mind about anything and everything. If you were to ask him about the current UK elections, he’d probably go off on a tangent about that – as would any “top” manager, to be fair. Mourinho, for example, will talk about the perks of living in a city like London over say, Madrid or Milan, while you could probably ask Arsene Wenger for help on your taxes. And of course, they would all gladly talk about football. None of them, however, speak as openly as Liverpool’s manager. Brendan Rodgers will speak candidly about Manchester City’s current form, for example, and in his spat with England manager Roy Hodgson, he holds nothing back. None of these topics, though, is on the level of his “war of words” with Louis Van Gaal. “I think what he’ll find is the competition in this league will be different from any other league that he’s worked in,” said Rodgers. “In a lot of the other leagues there are one or two teams and those are the teams that are expected to win. Fair enough. 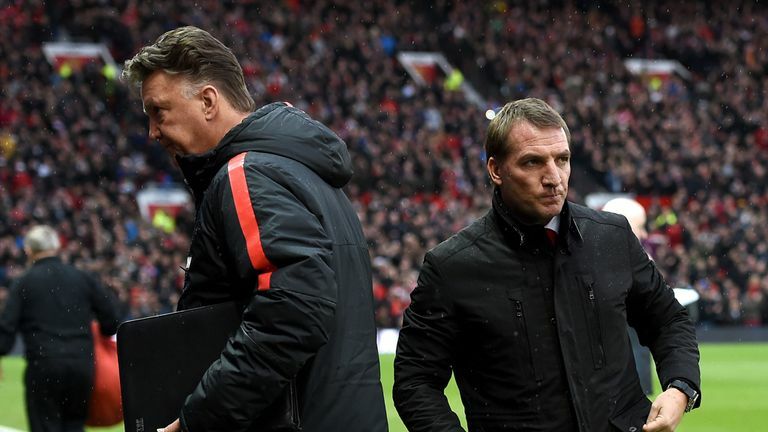 Brendan decided, as the runner up to Manchester City last year, that it was his prerogative to warn Louie, a man who has won in Holland with Ajax, Germany with Bayern Munich, and in Spain with Barcelona, that the Premier League would be different, that unlike these other leagues, there are no guarantees in the tough world of English football. I get that. I don’t quite see the logic in it, but it’s fine. But to do it again, in March, when the Dutchman has already beaten you 3-0? I mean, come on. “Even he would say that coming into the Premier League is different to where he’s worked before. The competition in this country is far greater. “He’s shown over his career that he’s a top-class manager. He’ll have seen coming into this country for the first time, the challenges of football here. I get that Brendan fancies himself the BPL’s welcoming committee, waxing lackadaisically about the virtues of the greatest league in the world™. But at some point, you gotta look at yourself in the mirror and realize that Louis van Gaal is not a man you want to engage in a war of words. Especially not after he’s exposed your tactics not once, but twice. I think, contrary to popular belief, that Brendan Rodgers is a fine coach. Where Brendan gets in trouble a lot of the time is when he decides to bite off more than he can chew, where it’s no longer Brendan Rodgers who’s doing the talking, strategizing and picking of the lineup, but BRENDAN RODGERS, direct disciple of Bill Shankly and protector of the Liverpool Way. That guy gets into a lot of trouble. After the first game against United in December, Rodgers, fresh off a 3-0 beating, praised his squad and said that Liverpool were the better team team that day. We laughed then, but for a while, until Rodgers met Louis again, Brendan was laughing. Liverpool’s Boxing Day run was nothing sort of extraordinary, but to me, it always looked like the work of a snake oil salesman (and added fuel to the fire that is BRENDAN RODGERS, protector the realm of Merseyside). Under Brendan’s tutelage, the Reds of Merseyside were always a team of momentum, with a few wins energizing them to pick up more and more. Couple that with a tactics wrinkle that not many teams in the Premier League were ready to pick up on, and you get the sort of run Rodgers had been able to engineer. Unfortunately for Rodgers the snake oil salesman, he ran into a merchant of spin in Louis van Gaal – not to mention a tactical genius. Matamatically, Brendan stood no chance. This entry was posted in English Premier League, Features and tagged BREEEEEEEEEEEEEEEEEEEEEEEEEEEEEEEEEEEEEEEEEENNNNNNNNNDDDDDDDDDDDDDDDDDDDDDDDDDAAAAAAAAAAAAAAAAAANNNNNNNNNNNNNNN. Bookmark the permalink.